To claim this profile, please confirm you are Khaliyah Binns. To follow this profile, please let us know your relationship to Khaliyah Binns. 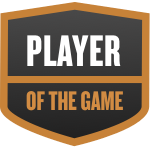 Khaliyah was selected the Player of the Game in the basketball game against Mammoth on Wed, Jan 23 2019. GREAT JOB AGAINST MAMMOTH AT HOME!!! Khaliyah's basketball stats have been updated for the loss @ Mammoth. RESULTLoss Girls varsity basketball @ Mammoth. The Mojave varsity basketball team lost Tuesday's away conference game against Mammoth (Mammoth Lakes, CA) by a score of 42-11. Khaliyah's basketball stats have been updated for the loss vs. Lone Pine. RESULTLoss Girls varsity basketball vs. Lone Pine. The Mojave varsity basketball team lost Thursday's home conference game against Lone Pine (CA) by a score of 48-20. Khaliyah's basketball stats have been updated for the loss vs. Mammoth. RESULTLoss Girls varsity basketball vs. Mammoth. The Mojave varsity basketball team lost Wednesday's home conference game against Mammoth (Mammoth Lakes, CA) by a score of 45-19. Khaliyah's basketball stats have been updated for the loss vs. Desert Christian. The Mojave varsity basketball team lost Tuesday's home conference game against Desert Christian (Lancaster, CA) by a score of 39-30. Khaliyah's basketball stats have been updated for the loss @ Lone Pine. RESULTLoss Girls varsity basketball @ Lone Pine. The Mojave varsity basketball team lost Tuesday's away conference game against Lone Pine (CA) by a score of 49-5. Khaliyah's basketball stats have been updated for the loss @ Desert Christian. The Mojave varsity basketball team lost Friday's away conference game against Desert Christian (Lancaster, CA) by a score of 43-17. Khaliyah's basketball stats have been updated for the loss vs. Immanuel Christian. RESULTLoss Girls varsity basketball vs. Immanuel Christian. The Mojave varsity basketball team lost Thursday's home non-conference game against Immanuel Christian (Ridgecrest, CA) by a score of 41-17. Khaliyah's basketball stats have been updated for the loss @ Trona. RESULTLoss Girls varsity basketball @ Trona. The Mojave varsity basketball team lost Thursday's away non-conference game against Trona (CA) by a score of 29-16. Khaliyah's basketball stats have been updated for the loss @ Big Pine. RESULTLoss Girls varsity basketball @ Big Pine. The Mojave varsity basketball team lost Wednesday's away non-conference game against Big Pine (CA) by a score of 31-18.